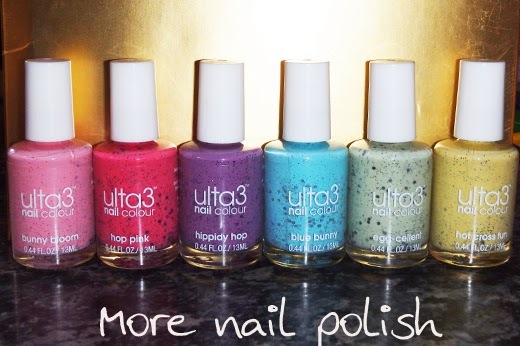 Ulta3, Australia's most popular and arguably most affordable nail polish brand has joined the speckled nail polish crazy just in time for Easter. The collection features six new shades that all contain fine black glitter and medium sized black hexes. This release of six pastels, which feel very spring like, ist quite different from what Ulta3 have done in previous years. Usually they come out with a Autumn/Winter collection around this time, featuring darker and richer colours for the colder months here in the southern hemisphere. In fact it was something I really loved about this brand, that us Aussies were able to get a range of new seasonal colours that matched our seasons, and not those in the Northern America and Europe. Although, such a spring looking collection matches nicely for traditional Easter themed manis, plus, I don't really let the seasons determine the sorts of colours I wear on my nails, so I'm sure Ill be able to put these to good use without having to wait six months for spring to arrive. This is the package that arrived from the Heat Group (Australia's distributors of leading cosmetic brands such as Max Factor, Govergirl, Bourjois et al). It was packaged to look like a little nest filled with speckled polishes - very cute!! Blue Bunny - an aqua blue creme with fine and medium sized black glitters. Same tone as what I think of as duck egg blue, but brighter. 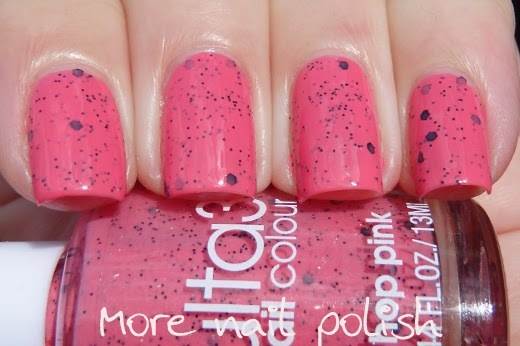 I found this one to be a bit too opaque for a speckled polish for my liking. The opacity of the polish really hid the black glitters that I was able to get out. Any glitters placed down in the first coat were almost completely covered by the second coat. You can just see a larger hex on my middle finger that was covered by the second coat.This is two coats with Seche Vite top coat. Great colour though. Bunny Bloom - pale pink creme with fine and medium sized black glitters.Again, just like Blue bunny, I found this one to be a little too opaque for a speckled polish. It was better than the blue one and you can see through to the larger hexes a bit better, but I wish is wasn't quite as pigmented. This is two coats with Seche Vite top coat. Hippidy hop - a dusty purple creme with fine and medium sized black glitters. Just like the last two, this one was too opaque for my liking for a speckled polish. I also wasnt' able to get very much glitter out of these more opaque polishes, especially compared to what you see in the bottle. This is two coats with Seche Vite top coat. Egg-cellent -a pale pastel green with fine and medium sized black glitters. This is more like it. The opacity balance on this one is just right, opaque enough to cover in two coats, but sheer enough to show all the speckled bits perfectly. This is two coats with Seche Vite top coat. 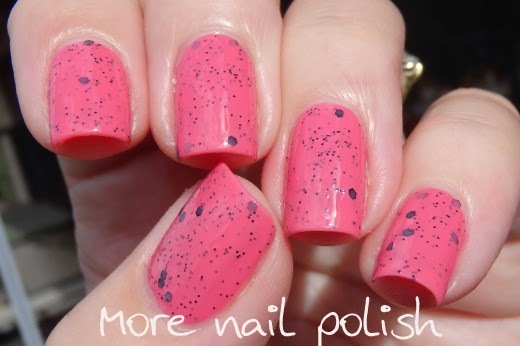 Hop pink - a brighter medium pink creme with fine and medium sized black glitters. Yay, they nailed it with the opacity on this one too, it shows all the glitters through both layers of polish creating nice depth and a slightly squishy jelly look. This is two coats with Seche Vite top coat. 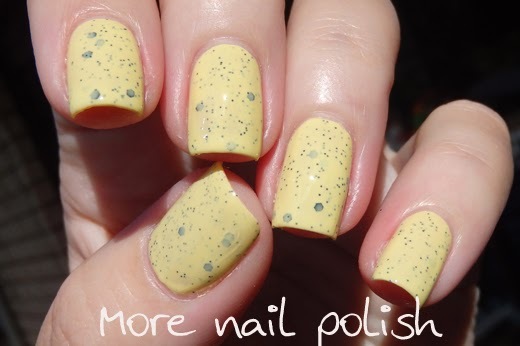 Hot cross fun - a pale pastel yellow creme with fine and medium sized black glitters. The opacity balance on this one was ok, and considering it's a yellow polish, which are notoriously streaky at two coats, this was very good. This is two thick coats with Seche Vite top coat. I love the colours in this collection and like how they look on my nails. I've not jumped onto the speckled bandwagon as yet, so these are my only speckled finish polishes. They actually fill a nice little gap in my collection. I just wish the first three polishes were a littler sheerer so they would show the glitters better. When applying these, try and ensure your first coat is quite dry so you can avoid dragging any of the larger hexes across your nail and leaving big dragged lines, this is particularly important with the more opaque shades. This happened to me with Bunny Bloom. The Ulta3 Speckled Collection is Limited Edition and will be available while stocks last from selected pharmacies Australia wide, this April. You can find your nearest stockist by using the Ulta3 stockist locator. You can now also purchase Ulta3 online directly from the Heat Group, so I assume these will be available online in April too. Oooo, I really like egg-cellent and hop pink - those were really pretty. The Egg-cellent one seems really unique as well! Might have to find dupes up in Canada now! Omg what a cute collection!